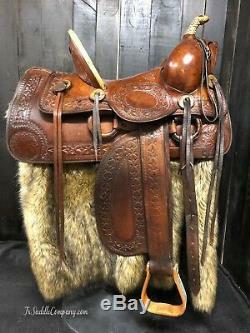 Beautiful Vintage High Back Saddle by Askew Saddle Company. 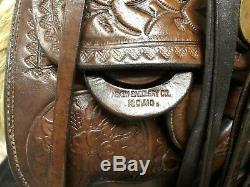 I estimate this saddle was built around 1920 in Kansas City, MO. It is in excellent condition for its age and was not used hard. It was found in an excellent collection on the east coast. 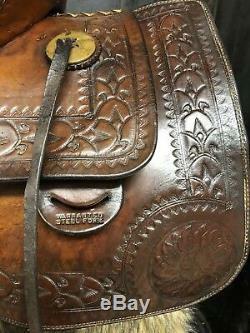 The light color is difficult to find on saddles of this age and it has very minimal wear on the tooling. 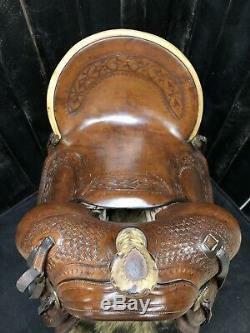 This was definitely a cherished saddle that was somebodys pride and joy. 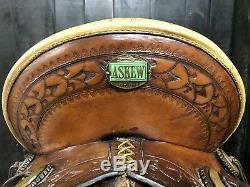 The saddle is marked with the Askew brand in 3 places and has a latigo keeper on the back left side that says Warranted Steel Fork. 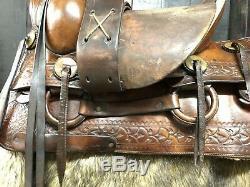 The leather is slightly stiff in some areas but overall in good condition. 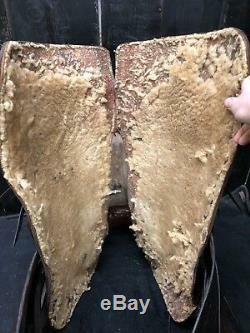 Sheepskin is in poor condition (dry & peeling). Some of the saddle strings are dry or broken. In 1866, when the factory was started, the company employed approximately 6 men and by 1900, the turn of the century, the company employed about 135 factory workers with many office, sales and administrative positions as well. 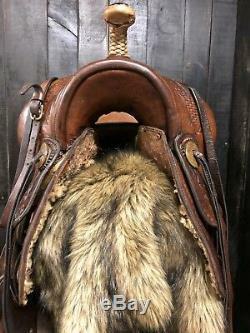 The Askew Saddlery Company was among the first established company to cater to a clientele of working cowboys who were driving their beef to market in Kansas City, Missouri or Chicago, Illinois. 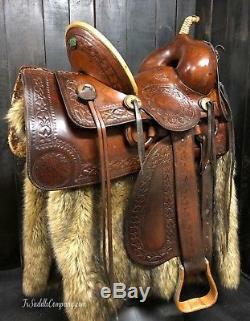 The product most noted from the Saddlery was the Askew saddle, known for being a superior product of excellent materials and workmanship and available in different saddle designs. These products were so desired that the supply from the Company spanned throughout Missouri as well as neighboring areas also. 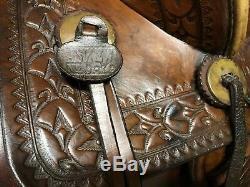 The item "Antique Askew High Back Saddle / Vintage Western Collectible Old Square Skirt" is in sale since Tuesday, January 15, 2019. 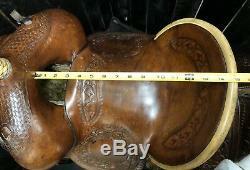 This item is in the category "Collectibles\Cultures & Ethnicities\Western Americana\Saddles". 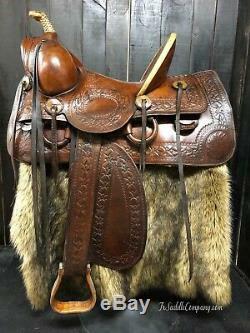 The seller is "fx_saddles" and is located in Ephrata, Pennsylvania. This item can be shipped to United States, Canada, United Kingdom, Denmark, Romania, Slovakia, Bulgaria, Czech republic, Finland, Hungary, Latvia, Lithuania, Malta, Estonia, Australia, Greece, Portugal, Cyprus, Slovenia, Japan, China, Sweden, South Korea, Indonesia, Taiwan, Thailand, Belgium, France, Hong Kong, Ireland, Netherlands, Poland, Spain, Italy, Germany, Austria, Bahamas, Israel, Mexico, New Zealand, Singapore, Norway, Saudi arabia, Ukraine, United arab emirates, Qatar, Kuwait, Bahrain, Croatia, Malaysia, Barbados, Bangladesh, Bermuda, Brunei darussalam, Bolivia, Egypt, French guiana, Guernsey, Gibraltar, Guadeloupe, Iceland, Jersey, Jordan, Cambodia, Cayman islands, Liechtenstein, Sri lanka, Luxembourg, Monaco, Macao, Martinique, Maldives, Nicaragua, Oman, Pakistan, Paraguay, Reunion.